ThinkPalm has been recognized as among India’s top 50 Great Mid-Size Workplaces 2018 by Great Place to Work Institute (GPTW). Previously in the year 2017, ThinkPalm was one among the Great Place to Work-certified organisations but this time (2018), it has made it to the top 50 list of Great Place To Work among mid-size companies.Great Place to Work® Institute is the Global Authority on Workplace Culture Assessment. Their proprietary and globally validated framework is considered the Gold Standard in workplace culture assessment and is endorsed by over 10,000 organizations in more than 58 countries across the globe. These organizations trust the Great Place to Work® Model to enable them to build and sustain a High-Trust, High-Performance Culture. In India, GPTW Institute studies more than 700 organizations every year and identifies the best as Great Place to Work – Certified Organizations. The team of GPTW visited Kochi Infopark on August 14, 2018 and formally handed over the certificate to Manoj K P, ThinkPalm Technologies’ Founder, Director & CEO. Dedicating this achievement to the entire ThinkPalm team, Manoj said, “This recognition is a true reflection of our collective efforts to make ThinkPalm a Great Place to Work. We stand committed to the cause of our employees, as we firmly believe in the extra-ordinary capabilities of the intellectual capital we possess”. 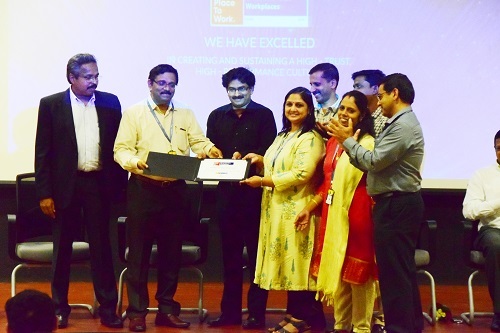 Congratulating the entire team at ThinkPalm Technologies, Hrishikesh Nair, CEO, Kerala IT Parks said, “On behalf of Kerala Government I congratulate ThinkPalm for this great recognition. Being recognized for the excellent work culture being provided by an organization is a great achievement as it reflects on the happiness and satisfaction of the employees working there. Such achievements are a great morale booster for all the companies based in Infopark, Technopark and Cyberpark to create a beautiful work life balance for all its employees.